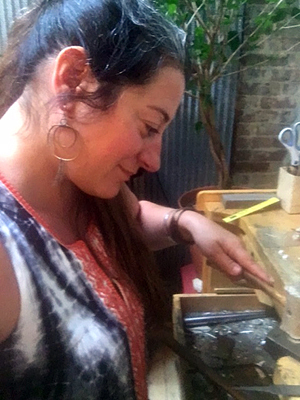 Jen has been creating her earthy, elegant jewelry designs in Portland, Maine since 2002. In the early years, she worked out of her tiny apartment kitchen on Munjoy Hill as a makeshift studio. She quickly started selling her work at craft shows and galleries all over the country. Her passion for jewelry design continued to grow along with her list of collectors. Inspired by the natural world, travel and fashion- she now creates her work out of a large, beautiful shop and studio space in the East End of Portland. In her shop, you can find her entire current jewelry line alongside local to globally made eco-friendly clothing, baby, apothecary and home accents. If you are interested in shopping in the store our hours are Monday & Tuesday by chance. Wednesday-Friday 10-5, Saturday 10-3, Sunday 10-2. We are located in area that offers wonderful restaurants, shops and breweries-come find us when you are visiting Portland!